Every time I turn around on the bus/subway or in the airport, somebody is watching movie on his iPhone. It's easy to buy movies designed to view on this little screen, but if you want to get your own DVD movies or videos onto your iPhone 8/Plus, you'll have to dive into the wide world of video converters. The iPhone 8 supports two basic video formats: MPEG-4 (.mp4 and .m4v) and MOV (QuickTime). Several software programs will accomplish converting DVD movies to iPhone 8/iPhone Edition, but not all of these programs are compatible with Macs. 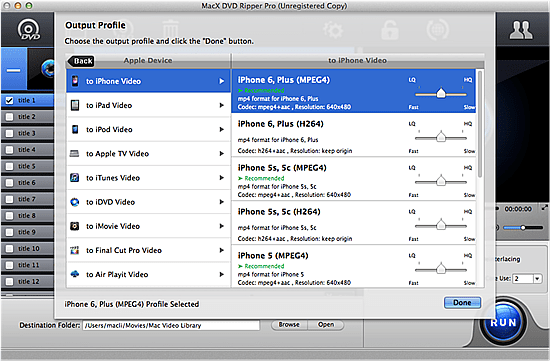 Fortunately, I've found the most user-friendly tool, MacX DVD Ripper Pro, with numerous profile settings for all generation iPhones provide a perfect solution for ripping DVD to iPhone 8/Plus on macOS and Windows (10) and remove all the copy protections like DVD CSS, region code, RCE, Sony ArccOS, UOPs, Disney X-project protection more with 36x faster speed, no quality loss. Simply open, select DVD location and output profile, finally hit OK. You'll have an iPhone-ready video before you know it. No.1 DVD to iPhone ripper for Mac/PC to rip any protectd DVD movies to iPhone Xs/XR/8/7/6s more in MP4, MOV, AVI, MKV, WMV, etc with 36x faster speed and original quality! Free download this DVD to iPhone ripper for Mac and launch it. Note that it also provides a Windows version for PC users. You can load a DVD Disc or DVD folder stored on your hard drive or ISO image file of a DVD simply by clicking the button like "DVD Disc", "DVD Folder" or "DVD ISO". You can convert any hot movies to iPhone like Beauty and the Beast, Dunkirk, Fast 8, etc as you like. In order to rip DVD to iPhone Xs, you can click "Apple Device" in the drop-down output profile menu and then directly choose "to iPhone Video" as the output format. Click the "RUN" button to begin the converting process. Time of backing up DVD to iPhone process will depend on your settings and your computer hardware level. Once the conversion is completed, you can transfer the output video to iPhone 8/Plus as you like. An excellent bare-bones option for encoding video to iPhone 8/8 Plus on Mac is MacX Video Converter Pro. It includes everything you need to transform video into iPhone, such as AVI, WMV, FLV, MKV to iPhone 8 Plus/iPhone 8, etc. It is recommeded for that it provides the fastest movie to iPhone conversion speed for its pioneering use of Intel's QSV hardware accelerationo tech, which is 5x faster than other tools available. As a bonus feature, this program also works as a powerful movie downloader which is able to free download videos movies music from 1000+ online movie sites like YouTube, Metacafe, Vevo etc. Best movie covnerter for iPhone to convert movies in 4K 8K UHD/HD/SD videos from/to MP4, MKV, AVI, etc for iPhone Xs Max/Xs/XR/X/8/7/Plus, up to 5X faster than others. 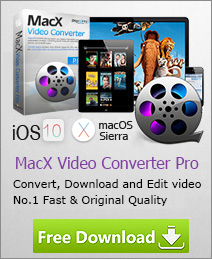 Free download the best video processing software for Mac and launch it. PC users can also get a Windows version. Click the "Add File" button to load video or drag the video files directly onto the interface. Then you can have a preview of the video with the built-in video player on the left. Batch video conversion is supported. In order to transcode video to iPhone, click "to Apple" button. In the drop-down output menu, directly choose "to iPhone" as the output format. Specify output folder on your computer to save the output files. Click "Browse" button to choose the path where you want to save the output files in. Click the "RUN" button to start transcoding video to iPhone 10. The super video conversion speed will help you get the wanted videos within the shortest time. Then you can transfer the output video to iPhone via iTunes. With this program, you can enjoy common video, watch HD video on iPhone freely. Follow me to learn how to download movies to iPhone 8/Plus with full length and no costs. And the steps to download free HD movies to iPhone will be included, as well. To download YouTube video for offline playback on iPhone 8 is now available to you. Simply download MacX and then you can fast decode YouTube video to iPhone 8 compatible format for unlimited playback with highest quality. Learn how to free download movies for iPhone 8, iPads in 4K, HD 1080p, 720p for offline viewing. Download the new released Hollywood/Bollywood movies without jailbreak.